Equipping most of the cars currently in use on European roads, the Monroe Springs range includes high-tech coil spring types such as the side-load compensation spring, the tapered wire spring and the mini-block spring. Monroe® Side-load compensation springs apply radial force due to their special shape and ensure optimal control of the vehicle at all speeds. 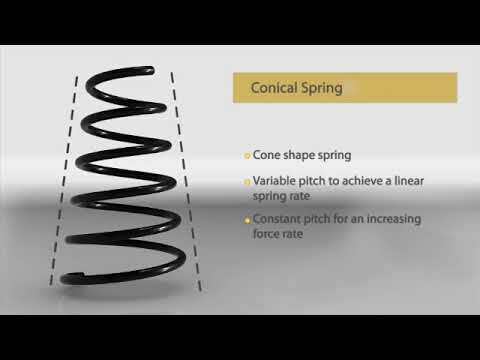 As a result, the spring rate increases proportionally to the spring compression rate. Monroe® mini-block springs are an advanced development of the taper-wire spring type: they have a rugby ball shape, offer longer life, and compact dimensions. In addition, mini-block spring coils compress perfectly without touching each other resulting in a noise-free operation (no coil-clash between adjacent coil ends). These increasingly popular springs are fitted only on rear axles; therefore they also improve boot space. Mini-block springs are fitted as original equipment in popular car models such as the Audi A3 and A6, BMW 3-series, Opel/Vauxhall Zafira, VW Golf and Passat.